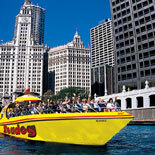 Climb aboard a specially designed Seadog speedboat for an unforgettable tour of Chicago’s iconic skyline. You will depart from the famous Navy Pier, travel along the banks of Lake Michigan and pass through the historic Chicago River Locks. The cruise up the river provides a majestic view of the Windy City’s most well known landmarks, such as the former Sears Tower. Now known as the Willis Tower, this 108-story structure is one of the tallest buildings in the world. You will enjoy close-up views of famous bridges, such as the Michigan Avenue Bridge. Constructed in 1917, the dark red Beaux Arts style drawbridge has four stone carvings on its northern bridge house that illustrates important events from the city’s history. During the 75-minute cruise, your friendly guide will entertain you with intriguing tales about Chicago’s attractions along the route. You will learn why engineers reversed the current of the Chicago River and how architects used innovative techniques to construct the world’s first skyscraper. Your guide will show you the building that was once the tallest marble-sheathed structure in the world. It cost the owners more than half the original price of their project to correct the mistake. Your tour guide will share fascinating insights about other Chicago landmarks, such as the Lyric Opera, the Tribune Building and the Merchandise Mart. After this informative tour, you will experience the wind and spray as the Seadog River and Lake Architectural Tour Chicago heads out for a high-speed trip on Lake Michigan. During this exhilarating run on a 2,000 horsepower speedboat, you will see several other well-known architectural treasures like Grant Park, Buckingham Fountain and the Chicago Museum Campus. An award-winning Seadog cruise combines amazing views and entertaining stories with an exciting lakeshore thrill ride. The tour is available April through October as weather permits.